Remember what blogs looked like in the early days of the internet? They were dull, uninteresting websites that people used to write down all the mundane details of their lives. Nowadays, though, blogs are popular, vibrant and in some cases wildly successful. Everyone has one, from your favorite Instagram celeb to your friends from high school. Creating your own blog is easy, especially if you use a website builder. You’ll be able to make an amazing, engaging blog, where you can store all of your works, thoughts, feelings and photos in a matter of minutes – with no complicated setup or coding experience necessary. You can use a blog for all sorts of purposes. You could, if you wanted to, use it like a digital diary. Or, you could use it as a career-boosting platform to showcase your writing, photography or videography skills. A blog can be a professional-looking interactive portfolio, and creating one can be easier than you think. Or maybe, you want your actual job to be a blogger. That’s an income few could have survived on merely five years ago, but bloggers are big business nowadays – with advertisers keen to target influencers with trusting audiences. This blogger created their site using Wix, our top-rated website builder. So, how do you go about creating a blog? We’ll explain in seven simple steps, with images, everything you’ll need to do to create a blog, how much you should pay for a blog (if at all) and the best blogging platforms to use. 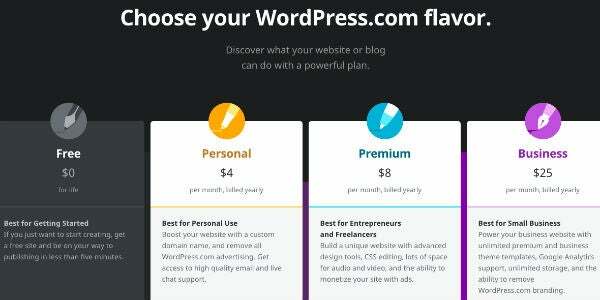 How Much Do Blog Platforms Cost? If you want to make a blog, a good place to start is looking around at other blogs that cover the same sorts of things you want to cover. This could be everything from travel, to fashion, to politics. If someone’s doing the same thing you want to do, think about how you can make it better or do it differently. This isn’t about copycatting someone else’s work – it’s about finding inspiration and seeing what you could do even better, and with a unique voice of your own. It’s worth paying attention to each blog’s design, and the way that it works. This will help you create a blog that’s as easy and painless to navigate as possible.This will get more people to visit your website, and look forward to returning. One of the most important decisions you can make is to choose the right tool to create your blog. It’s never been easier to build and publish a professional-looking website yourself, thanks to simple tools called website builders. These aren’t pieces of software that live on your computer – you access a website builder via a browser, logging into your account. This means you can update your blog from anywhere in the world with ease. Below, we list the best website builders for blogging. Any of these tools will help you build a great site, but in our extensive testing, Wix proved to be the best choice. It has brilliant functionality for experts, outstanding ease of use for beginners, and gorgeous ready-made templates to get you started. With prices from just $5 per month (we’d caution to avoid the free plan), Wix is an affordable way to publish a site, too. Verdict An amazing website builder, although its blogging platform isn’t perfect. An approachable website builder than doubles as a great blogging platform. Beautifully designed templates and a strong blogging platform make it a good, if expensive, choice. A great blogging platform although its design options aren’t the best. Almost the go-to blogging platform: It’s easy to use, with a huge community and loads of customization options. 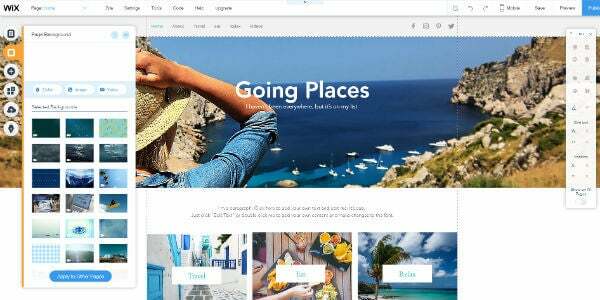 Wix is our favourite blogging platform, even though it’s designed as a website builder that can cover all sorts of site requirements. Like all Wix websites, you’ll have to pick a template that will inform the general design of your blog. There are loads to choose from, even for specific types of blog, from travel to food, and so on. But don’t worry if none of them really jump out at you – Wix has an in-depth page editor which means you can tweak the site to make look just right. Of course, once you’ve got the design out the way, you’ll want to start adding some actual blog posts. To add a new blog post you have to hover over a blog post to bring up the “Manage Posts” icon, or click on the “My Blog” sidebar button – from there, you get taken into the post manager section. This is where you’ll find the post editor – it’s a really straightforward blog editor, almost to the point of feeling under-featured. But it’s all there. You can add videos, images, and even custom HTML code into your posts. One thing to be wary of with Wix, though, is that the pricing packages allow up to 20GB storage. This isn’t loads – particularly if you’re going to be storing a lot of videos on your site, for example. WordPress is a blogging behemoth – according to its website, some 30% of the internet publishes via WordPress. Bloggers are most likely to go for WordPress.com, rather than WordPress.org – the names are similar, but the programs are very different. In essence, WordPress.org allows you complete control over your site, but you’ll need to find someone to host your domain, whereas WordPress.com will host your site but you’ll have less freedom over your site. When you start with WordPress to make a blog, you’ll realize pretty quickly that it’s designed to work as a blogging platform, rather than a “website builder with a blogging element”. There are fewer options to edit the actual design and layout of your template, but there are loads of templates to choose from. You could easily spend hours trying to find the right one. The blog post editor is an incredibly straightforward text editor. It even looks like a stripped-down version of Microsoft Word – it’s not surprising that WordPress has become the most popular blog site out there. You’ve also got more room to customize individual blog posts within WordPress than other website builder blogging platforms. You can access the raw HTML code for each blog post, which makes it great for custom-formatting. 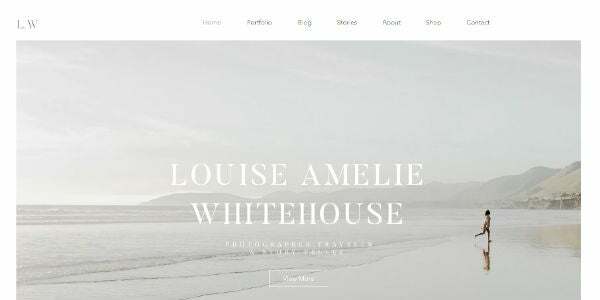 Priding itself on its template designs, Squarespace is the website builder to go for if you want to have a great looking blog with minimal fuss. There are only 91 templates to choose from with Squarespace, but they all look great, and most would make fantastic blog templates. Adding blog posts with Squarespace is a bit different to most other blogging systems. You start off with a blank text editor (fairly standard), but you add images, and other elements using a line-by-line system which can feel a bit unusual at first. In practice, it works well enough, but it is slightly clunky as blog editors go. However, there is a silver lining – Squarespace’s blog post preview system gives you a very clear impression of what the piece will look like once published. One advantage of Squarespace over Wix is that you get unlimited storage on the cheapest paid for package – so while you don’t get the depth of page customization, you’ll be able to have as many videos and photos as you want on your site. Read more – Why are Squarespace’s templates the best? Once you’ve chosen your blogging platform, you’ll need to create an account. 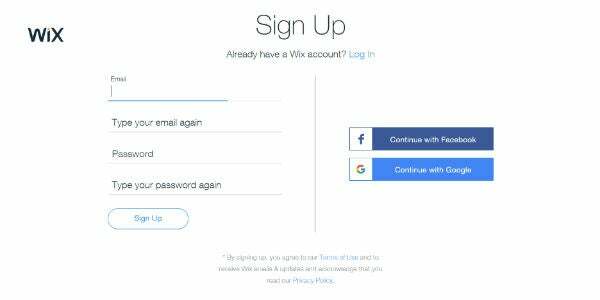 Typically this is with an email and a password, but some platforms will let you login with an existing Google account – making the process even quicker. Wix and WordPress offer indefinite free packages, so you won’t need to pay anything, ever, to get a blog with these two platforms (we’ll explain why this probably isn’t a great idea later). Squarespace, on the other hand, only offers a 14-day free trial, although you won’t need a credit card to sign up initially. With your account out the way, you’ll need to pick a name for your blog and a domain name. It’s important to remember that these are not the same thing – a domain name is the address your website will be registered to (for example, Tech.Co’s domain is www.tech.co). It’s worth trying to make your domain and the name of your website memorable – this will help you grow your blog and keep people coming back to your site. You don’t want anything too long, and while you can use your own name it isn’t likely to be the most memorable – everyone knows how tricky it is to remember names! All of these website builders will take of the domain hosting for you, once you sign up for a paid-for package. This means that you won’t be lumbered with an unattractive domain name like tomfogden.wixsite.com/mysite-1, for example, and you won’t need to find another company to host your domain separately. You’ve picked your blog provider, created the account and your blog’s name. Now the fun part begins with picking the template. Wix, for example, has over 500 templates. Some 38 are designed specifically to be used as blogs – although you can add blogging elements to any of its templates. Squarespace has fewer template designs overall, around 90, but are generally more aesthetically pleasing – though that’s not to say Wix’s are ugly. One thing to note about Wix is that, once you’ve picked your template, you can’t change it. WordPress works with a slightly different model when it comes to picking templates. 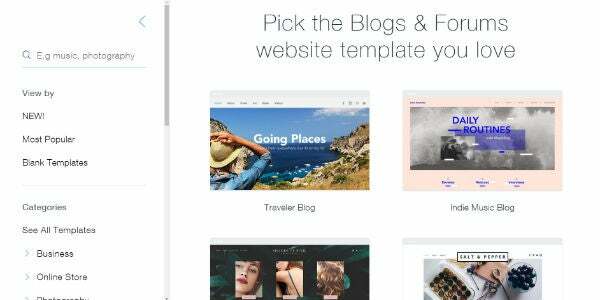 It offers a choice between paid-for and free templates, including a host of designs created by third-party developers – these paid-for templates can cost anywhere between $20 to over $100. When you’re creating a blog, you generally want a theme that will highlight recent and important blog posts on your homepage, rather than having them spun-off on different pages and sections of your site – this is crucial for helping people find your content quickly and easily. Most blogs nowadays tend to feature a lot of high resolution banner images along the top of the page, so it’s worth having some good photos ready to use if you choose one of these templates. Your template will also need to be mobile optimized. This means that your blog will scale to the size of the device someone is reading it on. Most website builder templates are mobile optimized nowadays, but it’s worth double checking, just to make sure. Of course, just because you’ve picked your blog’s template, that doesn’t mean it’s the end of the designing. You’ll now be able to tweak and amend aspects of your blog’s template, whether that’s changing the size of the text on the homepage, or changing the type of pages you have on your site. With Wix and Squarespace, this redesigning aspect is a crucial part of the building process, and is fully encouraged by the sites with their extensive drag-and-drop editors. With WordPress, though, the design alterations you can make are slightly more limited. This is partly because of the way WordPress’ templates work, but also because WordPress.com is more restrictive than WordPress.org. You can, however, upload templates to WordPress, and there are loads of developers out there whose templates you can use. With Wix and Squarespace, it’s important to edit your blog’s design to make it feel unique. After all, there are likely to be hundreds of blogs using the same templates as you. With WordPress, however, because you can upload custom templates, this is likely to be less of an issue. So, now that all the set-up is out the way you can, actually, start writing your blog posts! There’s no need to be in the dark, either, about how successful your writing is. Most website builders have site analytics tools built-in, so you can see at a glance how many people are engaging with your posts. You can easily add social media buttons and sharing functions, so your readers can spread the word far and wide about your great content. If you want to create a great looking blog, with no adverts, a proper domain name and storage for images and videos, you’re going to have to pay for it. Now, this isn’t something to be scared of – in fact, quite the opposite. After all, your blog could transform from a hobby into a business and even a career. 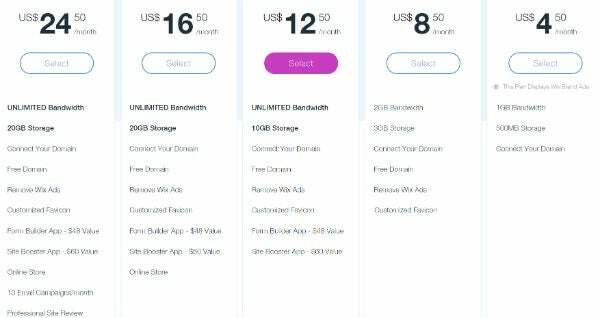 Wix’s Connect Domain plan is the cheapest way to get a custom domain name for your blog, but frankly, it’s too limited for a paid-for package, considering it doesn’t remove adverts and gives you very low storage and bandwidth options. The Unlimited plan is probably the best compromise between six plans, giving you decent storage and no adverts. It’s only a modest step up in price from the Combo plan as well, so you’re hardly being short-changed. The eCommerce and VIP plans are do offer more storage, which would be handy for blogging sites. However, you also get access to other features which might not be necessary if you’re running a blog. For example, an online shop, form-building apps and professional site reviews aren’t exactly top of most bloggers’ list of demands. Squarespace’s pricing plans have some features that most bloggers would definitely appreciate. For example, you get access to unlimited storage and advert removal on its cheapest plan. However, there are fewer pricing plans with Squarespace than with Wix, and they’re typically more expensive. If you’re building a blog, there’s no reason to pick either of the Business plans – you won’t need access to the eCommerce features. However, the choice between the two Websites packages is a little bit trickier. Really, it depends on whether you think a custom email is likely to be useful, and how adept a coder you are. It’s probably best to start with the Personal plan and then move onto Business plan once your blog begins to grow. WordPress’ free plan is a good base to start from, but if you want your blog to be successful, you’ll really need to opt for a paid-for plan. The Personal plan is certainly a good option for new bloggers. But given the Premium plan is only $4 per month more, it seems like the better choice with more storage and deeper customization options. The Business plan sounds scary, but really it offers you the very best of WordPress, with unlimited storage and almost free-reign over your website. You could, of course, opt for a self-hosted WordPress.org site which will give you complete control over your blog. You can read more about that in our full WordPress review. You can create a blog for free – but you probably wouldn’t want to, for a few reasons. Firstly, you’ll be lumbered with adverts for whichever blog platform you use. This might be simply a line at the bottom of your page telling people which platform you use, or it might be banner adverts along the top and sides of your page. Either way, it doesn’t look great. And these ads won’t be making money for you, either, but for the website builder platform you’re using. Secondly, you’ll be restricted on storage. We’ve mentioned this before, but it’s a critical flaw with free website builders – with restrictions on storage ranging from 500mb to 3GB on free packages, it’s going to be extremely unlikely that you could store your photos, videos and other assets on your site. And a blog with no images looks, well, a bit low-rent. Point two is crucial. This means that if someone is searching for “Travel blogs”, for example, your website will stand little chance of appearing in the first few pages of Google or Bing. Of course, if you’re just using your blog as an online diary and don’t really have any plans to attract large readerships these free packages might be fine. But, if you want to grow your blog, you’ll need to pay for it. 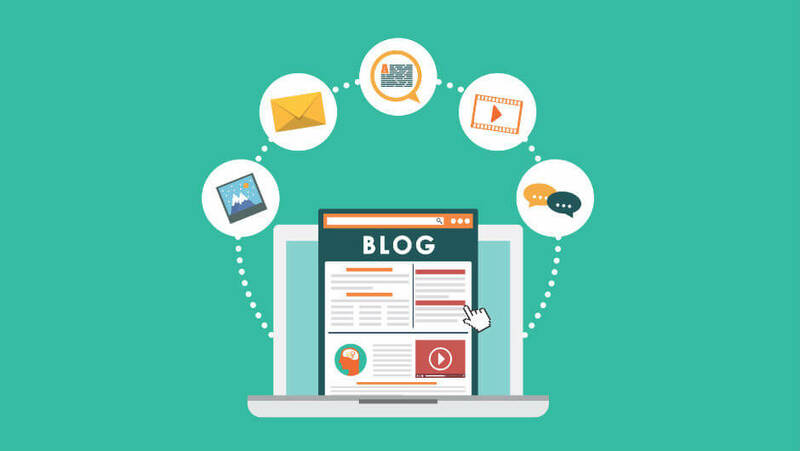 Get Started With Your Blog! It’s super easy to get started with your own blog, especially when using a website builder like Wix or WordPress – and it can take as little as 20 minutes to build and publish your first post.